Osip Mikhailovich Deribas (Don Joseph de Ribas) is a legendary figure in the history of Odessa. 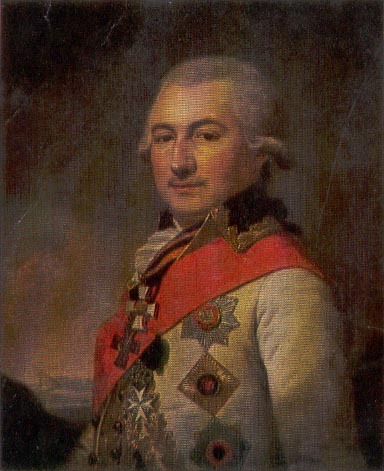 His father was Spanish(de Rivas) and his mother Irish (or, according to some, French).De Ribas served in the Neapolitan Army, from which he transferred to the Russian Navy through the patronage of Count Alexis Orlov, one of Empress Catherine the Great’s favorites. He was then only twenty-five and dreamed of doing noble deeds in the style of medieval knights. Russia gave him the opportunity: DeRibas fought for her on land and sea—in infantry, cavalry, rowed flotilla, and canon ship. His troops stormed several Turkish fortresses, including Ismail, an exploit Byron celebrated in Don Juan.Extraordinary rumors and gossip swirled around De Ribas,and the powers-that-be intrigued against him. They said, not without foundation, that he had been the chief plotter in the kid-napping of the adventuress “Princess Tarakanova,” a pretender to the Russian throne. He was accused of bribery, embezzlement,being a shill for cheating at cards, and even bigamy. De Ribas was indeed a man of action—daring and impatient—and he did have an illegitimate son, did play cards professionally, and was not always rational in his use of money. But he was no bigamist, card sharp, or bribe taker. He had two daughters—Catherine and Sophia—both godchildren of Empress Catherine II. In a royal note to De Ribas dated 27 May 1794, the empress instructed him to begin building a significant military and commercial port ahe village of Khadzhibei. However, the real first day of Odessa’s life is considered to be 22 August (2 September New Style) 1794, the day that the first piles were driven for the piers, a symbolic furrow was drawn on city land, the lots to be given to the first settlers for construction were plotted, and the first churches were started. At the intersection of the future Lanzheronovskaya and Rishelyevskaya streets, the very heart ofOdessa, the foundation was laid for the first official residence,belonging to the chief military leader of the empire’s southwest region. Prince G. S. Volkonsky. The ceremony consisted of the articipants—apparently, De Ribas, Volkonsky, and the actual irector of the construction of the city and port, the military ngineer F. P. De Voland—smashing a bottle of fine wine and several delicate crystal goblets against the stones. Along with the ritual coin bearing the empress’s monogram, fragments of the glasses, the crvstal trav. the bottle, and even the cork were found b archeologists in the foundation trench, under the base of the msonry wall.